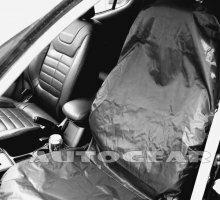 2 Single Hi-Back Waterproof Front Seat Covers to fit most models. 100% high density waterproof nylon. Resistant To: Travel Sickness, Children's Spills, Food & Drink, Pets, Dust, Mud & Paint. Ideal For: Builders, Farmers, Home Mechanics & Tradesmen.